Ignorance of law is no defence” is a celebrated maxim in legal jurisprudence and reckoned to be one of the most cardinal principles in criminal administration of justice. Implications of this maxim are not limited to mere academic interest rather capable of touching even an ordinary citizen's life. It presupposes that every citizen knows every provision of every law of the land, be it possible or not. Say, for example, being an ordinary city-dweller and oblivious to the civic etiquette you have spitted on the road of Dhaka and much to your surprise, got arrested by the police. Here your plea of ignorance that 'spiting on road is an offence according to the Dhaka Metropolitan Police Ordinance, 1976' will come to no help. It will not be convincing enough on your part just to prove that it is humanly impossible to know, even for a seasoned lawyer, every section of almost 1,400 operative laws in Bangladesh. But whatsoever bizarre it may sound, the inevitability of this maxim cannot be ignored so cheaply. Except for this principle a thief or even a murderer could plead not guilty forwarding ignorance as a defence. We cannot allow that to take place, can we? Immediately it follows that indispensability of access to law and legal provisions, at least some basics of these, cannot be overemphasised. Is this most suitable word? May be you could think of an alternative. Getting access to laws is to be seen as a right of the public and state cannot ignore its duty to facilitate the accrual of this right. But unfortunately in Bangladesh getting laws on demand is not that easy even for a lawyer. And, as all reasonable persons may agree, accessibility is not all about physical reception of laws but also includes understandability of contents and consequences of those, if not ramifications. After all, there is no point in being bombarded by scores of laws and understanding nothing out of those. But the characteristic language in which laws are framed in our country is more than enough to daunt any ordinary person. One may rightfully ask why laws are typically couched in such complex and incomprehensible manner. This can well be an interesting research subject. The first instance of drafting legal provisions in almost impenetrable way and inordinately lengthy sentences can be traced back to the interesting yet ridiculous practice introduced by the tabelliones of ancient Rome. This counterpart of today's conveyancer appeared in late Roman Empire with the task of drafting legal documents like wills, conveyances and contracts. They used to ornament the simplest legal transactions with mountains of legal jargon, just to make things exceedingly lengthy keeping in mind that fees were to be paid by the number of lines. Somehow, someway that culture perpetuated. Today it is more of a custom for most of the legal experts, if not all, to accord disproportionate emphasis to mere technicalities of law rather than substance and spirit so as to take legal matters far away from public understanding. Consequence of such inaccessibility of law to masses is the confinement of the subject within a very privileged and well-defined class known as lawyers, and it helped nothing but the monopolisation of legal affairs. But unfortunately, to the lawyers' preference, law-framers in almost every common law countries scarcely have done anything to turn around the state-of-affairs. As laws are meant for general public and they are meant to abide by the legal provisions, it is not only desirable but also essential for general people to know and understand laws. But is it possible to frame such a supposedly 'very technical' subject like law in a manner easily understandable to laypeople? Or, it only sounds good as an egalitarian idea and is practically unviable, and thus unachievable? Whenever we talk about simplifying legal texts to make things understandable to non-lawyers, we must cherish the name Napoleon Bonaparte. He headed the drafting committee vested with the responsibility to bring into life the 'Code civil des François' or 'French Civil Code', which supplied the necessary impetus for pro-people codifications of laws of other civil law countries. Napoleon had no academic background in law but was gifted with acute sensibility and exceptional prudence. During the process he was quite successful in putting a leash on the prospect of debates on merely technical issues reaching a hair-splitting level, and thus was able to keep things down-to-earth. Being constantly kept on toes, the draftsman always had to ask himself whether the words he had chosen would withstand the quires of Napoleon, who was very determined to make a code comprehensible to even a layperson. French Civil Code still is celebrated for its unique clarity and lucidity. Another important aspect of access to law is the people's involvement in the justice system. Is there any better idea than to create an ownership feeling among the citizens about the system through which their disputes are to be resolved? But how can it be possible? In the Soviet era judges were elected by direct and universal suffrage or by people's representatives. All the judges were elected for five years with the scope to be impeached at any time before maturity of tenure. For a regime with the goal to establish popular sovereignty, it was more of a matter of necessity to draw ordinary people (even from peasants and workers) to dispose of the functions of judges. It was more so in the case of lower tiers of courts having Comrades' courts at the lowest level. Comrades' courts were local collectives charged with exerting social pressure on individuals who were guilty for breach of social norms. Another greatest example of facilitating people's involvement in justice administration can be found in the yet earlier pages of legal history. American settlers of European origin knew the unmistakable dangers of a highly monopolised legal business and found 'deprofessionalisation' of the law-practice to be the appropriate answer fitting their newly emerged radically democratic society. President Andrew Jackson spearheaded the mission as a result of which almost all states enacted laws requiring that judges got to be elected directly by people or indirectly by people's representatives for a specified period of time. Even today a clear majority of states hold on to this ideology. Yet more striking move in 'deprofessionalising' was the introduction of statutes whereby every citizen, irrespective of his/her educational background, was entitled to practice law. And there is no point in liberalising the profession keeping all its unnecessary technicalities and formalities intact. So, necessary reforms were brought in. Both substantive and procedural laws were simplified accordingly. But at a subsequent point of time legal professionals realised that their best interest would be best served by means of 're-professionalisation' of lawyering and were able to establish the rule providing reservation of the profession only for law degree-holders. Such was the persistence of the professional organisations of lawyers that it also ensured: professional competence plays a greater part in the selection of judges. Obviously, monopolisation of profession is exclusively in the interest of that bunch of people who are in a position to yield the fruits of such monopoly. More popularly known form of involving members of mass people in disposal of disputes is the Jury system. The tradition of jury trial still goes strong in the United States with all its attributes. England still remained heavily reliant on jury system at different tiers of its court system. Documented history suggests that greater access to law and people's involvement with justice administration brought no disaster to human race. People's confidence in law and justice requires the development of a sense of belonging among them. Otherwise law and justice will continue to remain within the exclusive domain of a small but highly privileged group of individuals. Are we ready to respond to the call of dispelling that monopoly? 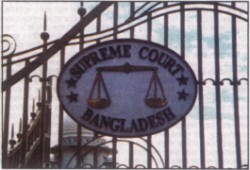 The author is an Advocate, Member of Dhaka Bar Association.